One of the toughest challenges in transitioning away from fossil fuels is that, in order to make energy systems that contain a high share of fluctuating renewable energy sources (like solar and wind) function reliably, we still need ways to affordably balance electricity consumption and production. Systems capable of storing surplus power during times when production exceeds consumption have a vital role to play in connecting more renewable energy systems to the electrical grid, according to a recent report by the Technical University of Denmark (DTU). Among a variety of options to help load-balance the electrical grid, the report talks about a virtual power plant (VPP) — a group of smaller generators or storage systems able “to act as a single unit via power electronics, IT and communication systems. 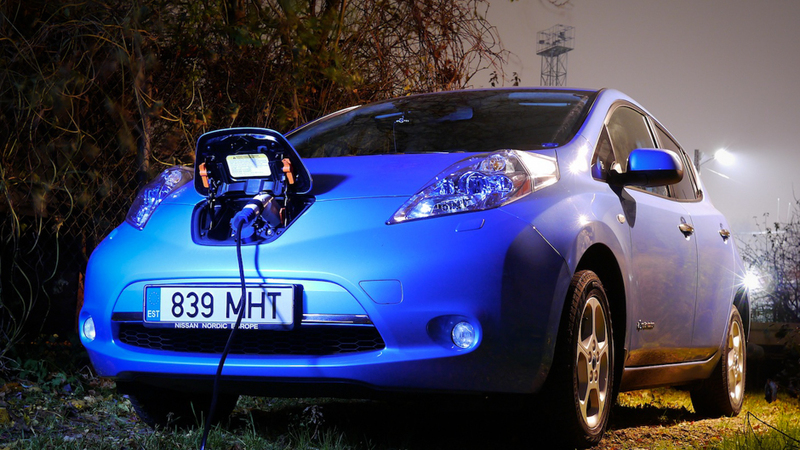 One example is a VPP based around the batteries in a fleet of electric vehicles”. “Electric vehicles (EVs) and plug-in hybrid electric vehicles (PHEVs) are potential game-changers in future power systems due to their great flexibility in interacting with the power grid,” the report notes. And that future has already begun. Nissan last week announced completion of a successful early field test of its new “Vehicle-to-Building” system that will let companies regulate their electricity bills by drawing from the batteries of Nissan Leafs used by their employees to commute to work. In use since July at the Nissan Advanced Technology Center in Atsugi City, Japan, the system can connect up to six Nissan Leafs to a commercial building’s power distribution board. Then, at peak hours when overall energy demand is highest and electricity is most expensive, the building draws power from the cars. When demand drops and electricity is cheaper, it flows the other way. The system always ensures the cars are fully charged by the end of the day so their owners can drive home. During the field test period, the Nissan Advanced Technology Center achieved a rather impressive “2.5 percent reduction of electrical power use during peak hours, a saving of nearly 500,000 Yen [approximately US$4,900] per year in electrical power cost (based on current Tokyo Electric Power Company rates)”. Nissan plans to further test and refine the “Vehicle-to-Building” system, which is a further development of the “Leaf-to-Home” system, launched last year in Japan. The home system’s power supply unit (developed by Nichicon) is a suitcase-sized two-way charger capable of both fully charging a Leaf in just four hours (half the time of an ordinary charger) and also supplying a home’s electricity distribution panel from a Leaf’s high-capacity batteries. Fully-charged, the lithium-ion batteries in a Leaf store up to 24kWh of electricity, which Nissan says is plenty to power the average Japanese household for two full days. These home power units allow Leaf owners to charge their cars with electricity generated during the night when demand is low, or sourced from solar panels, and balance their energy costs by supplying electricity to the house during the daytime when demand is highest. They can also be used as a backup power source in case of a power outage and/or shortages. New Nissan System Lets EVs Power Buildings by Carol Smith is licensed under a Creative Commons Attribution-NonCommercial-ShareAlike 4.0 International License. Based on a work at http://dailyfusion.net/2013/12/nissan-leaf-battery-to-power-office-buildings-25378/.